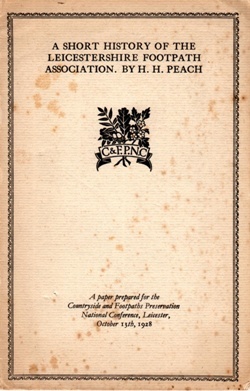 A short History of the Leicestershire Footpath Association by Harry H. Peach – A paper prepared for the Countryside and Footpaths Preservation National Conference, Leicester, October 13th 1928. For the benefit of those who do not know our city well, may I start by making a claim for Leicester as a centre where things are pioneered. Trial by jury and primogeniture were first granted at Leicester and the interesting story about them you can read in your Green’s Short History. Simon de Montfort, pioneer for English freedom and representative government, and some say saint, was proud of his connection with Leicester. Wycliffe and his Lollards first preached and suffered round here. George Fox, founder of the Society of Friends, came from Fenny Drayton. The Chartist movement started here. Our consecrated cobbler and missionary maniac, as a lecturer called William Carey, mended his shoes and preached here, and helped to keep the flag flying in the intellectual life of the town, before he went out to India, founded his mission and did his wonderful work at translation, printing, founding botanic gardens and other pioneering. We can even claim our association to be older than the Commons and Footpath Association, for in the ‘forties there was a footpath movement here. Mr. W. Green, a former resident of Leicester, says, “My recollection of the Leicester Footpath Association goes back to the ‘forties, and I well recollect that the first committee in Leicester consisted of Thos. Podd, James Thompson, sen. (Leicester Chronicle) and my father, Henry Green.” It was formed to open a path from Humberstone Road through what is now Spinney Hill Park to Thurnby. Another reminiscence possibly of this association, which died before ours started, was when Mr. Napier Reeve, then Clerk to the Peace, threatened the Earl of Stamford (in an early attempt to close Bradgate Park), to break down his barriers on a certain date if they were not removed. The story goes on that the barriers were removed before Mr. Reeve’s arrival. Our present Association started in 1887 and the first meeting was in the School Board Room at the Municipal Buildings on June 10th, W. Simpson, jun., in the chair. Mr. Louis Hodges, whose later efforts for the Association many will remember, joined during the first year. The first chairman of the Committee was the Rev. Canon Broughton. The Committee consisted of Messrs. Appleton, W. A. Evans, J. M. Gim-son, G. Hall, T. C. Lee, J. W. Musson, A. H. Paget, W. Simpson, jun., and J. Tait. Mr. Arthur J. Gimson was hon. secretary and treasurer, and for nearly thirty years devoted himself to the work, and it is to him and his efforts mainly that we are here celebrating the fortieth year of our Association. He remained hon. secretary till his death in 1912. One of the notable facts of the Association’s early days was the help it had from the clergy, though I regret to say that to-day we have none on our membership roll, and I cannot help feeling that it is a pity for both of us. Think what the clergy might do in helping to keep our villages pleasanter places, apart from assisting to preserve public rights. In 1889 there were two canons and thirty clergy (Church of England) members, whilst the Bishop of Peterborough, the local M.P.s and the then Marquis of Granby (it may amuse members of the Peak District to know) were honorary members. The Association was soon busy protesting against enclosures and stoppage of footpaths, and immediately started to mark the maps of the district with footpaths then known, and it is interesting to see recorded the names of the Rev. J. Martin, T. Cope (later Sir Thomas Cope), and Mr. R. F. Martin, as among the first to offer to mark the maps for their districts. I mention this as they were all gentlemen connected with the County Council and latterly, I am sorry to say, we have not had much help from that body, but we hope, however, that as our chairman to-day is also chairman of this body we may get more help in the future. The first list of members, as well as the committee, included many whose names should be remembered by all Leicester citizens as having done their share in keeping alive the intellectual and artistic life of Leicester. Miss Gittins, Messrs. Atkins, Barradel, Biggs, Billson, Bennett, Burgess, Cooper, Gimson, Stockdale Harrison, Paul, Spencer, Stocks, etc., etc. I notice in the early days the Swithland and Hallgates paths were causing trouble. Some of us remember many a tramp and beating down of fences, pulling up of thorns, and discussions with keepers, who tried to stop our using the latter path. Complaints have come in again recently about the Hallgates path owing to stoppage by a new owner. It is interesting to read how they tackled the job. 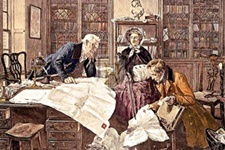 First a map was prepared showing the paths, and a letter was sent to the papers. Then copies of the map were put up in inns, clubs and other places in the immediate district where they would be likely to attract attention, says the report. The Vicar of Swithland at that time must have been rather a terror as there was continuous trouble about the Swithland path. On May 18th, 1889, a party of ladies and gentlemen drove to Swithland and removed barriers at the end of the path. Ladies were not great footpath walkers in those days, and with their long dresses awkward stiles made it difficult. I wondered who these ladies were. In 1888 it is recorded that on September 22nd, eight members of the committee drove to Cropstone to investigate the Deer Barn path, which the Corporation were interfering with in connection with the reservoir, and there was quite a tussle for a time to save this. Local Bills before Parliament were watched, amendments were sent up to Mr. Shaw Lefevre’s Bill as to Footpaths and Commonlands. The same year the famous case about rights on towing paths was recorded. Many cases of paths and enclosures and map markings were among the things done. The Anstey Lane and its wide roadside was always a tempting spot for adjoining landowners, and it was jealously watched by the committee in the early attempt to make the road. Some will recollect a final attempt to enclose part of it during the war on the excuse of war allotments. About this time commenced the important case about the enclosure of roadside waste in the Stoughton Lane, and had it not been for the Association the present pleasant green roadsides would not be there. But of this more later. The first law case recorded is that of Walter Whetstone v. T. -Hardy and others, about the Broomleys path, Whitwick. This took place at the Assizes in February, 1889, and the Association supported some working-men who were summoned for trespass and damage. The report says that “on a certain day the inhabitants of the village were assembled by the ringing of a bell. Headed by the defendants, they proceeded to the site in question, knocked down the fences, uprooted the trees, trampled the grass and created damage.” Ann Biggs’ evidence much amused the Court. This case cost £58, towards which the inhabitants of Whitwick collected £26 55. “The spirit and energy of the inhabitants in this case prevented the necessity of direct interference by this Association. It is always desirable that this Association shall be looked upon rather as the adviser and helper of the people really concerned, than as a body interfering to protect the rights of the general public. At the same time your committee will not hesitate to actively champion a public right which is in danger of being lost through the apathy or timidity of the people of the district in which the encroachment is made.” It was this year that the public, by abusing the privileges given to them, caused Mrs. Perry Herrick to restrict the access to Beacon Hill and the Association was instrumental in getting this matter reconsidered. Speaking of the late Mrs. Perry Herrick, may I say a word as to her love of fair play in all matters to do with footpaths on her estates in the hope that the family tradition may be continued by the present owners, should occasion arise. The Bardon Hill path was another which the Association got clearly defined, and since then it has been regularly used. The years 1890 and 1891 were very important ones in the history of the Association, as then took place the finish of the fight to save the enclosures of the roadside waste on Stoughton Road by the then adjacent owner, Mr. Powys Keck, and the prevention of the sale of St. Margaret’s Parish Piece. In the former, the case came before the Courts and the owner was indicted for infringing public rights. The Highway Board had previously agreed to let Mr. Powys Keck make the enclosure in spite of protests from the Association, and at the trial, in which the Association won, the summing up of the judge was entirely in favour of the public right and strongly condemned such an arrangement as had been made between the Highway Board and a private owner. 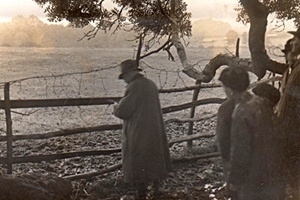 It should be remembered that Mr. Powys Keck had erected a strong oak fence, making the enclosure. The report for the year says “No one can walk through the lanes and roads surrounding the borough without seeing instances of serious mischief done in this way. Many of these pieces of land may now be lost without hope of recovery.” Have you ever thought what these enclosures must be now costing the highway authorities in their widening of public roads for motor traffic? Recent decisions of the Court have, however, declared that the highway authorities can reclaim all enclosures of the roadside wastes after any period of enclosure without compensation if the matter is clear on the enclosure award. There is little doubt but that this case prevented many others from attempting similar enclosures. The other great achievement of the year was the saving of St. Margaret’s Parish Piece, or rather the major portion of it. The vestry applied for power to sell the 191/2 acres it held, and this was opposed in Parliament by a petition prepared by Mr. A. H. Bennett suggesting that the ground was required for recreation ground and open space. An enquiry was held and Mr. W. Simpson, as honorary advocate, made such a good case that as a result the report was given very favourable to the recommendation of the Association and the vestry withdrew their bill. The committee then met the vestry, and it was decided to recommend the Town Council to purchase the land, and as a result 12 acres were purchased out of the 191/2, and saved for the town. I daresay that there are many who do not know the open space behind Belgrave Gate and at the side of the Cossington Street Baths. The City fathers have not used much imagination in its layout, and it really might be made a much pleasanter spot. Anyhow, it was saved and it has meant much to the children of this thickly-populated neighbourhood. During the ‘nineties the Society continued its vigorous work, recurring hardy annuals still known to us in these days, like the old Anstey Lane and its wide roadside was in danger several times, and the paths round Bradgate. Mr. R. F. Martin wrote an interesting history of this lane in the “Daily Post,” which was reprinted at the time. In 1895 the coming of the Great Central interfered with many paths, and these were carefully watched. An enclosure case at Ashby Lodge in the lane between Thorpe Satchville and Gaddesby, came to the Assizes, but was settled out of court, and obtained a restitution of part of the land enclosed; and the surrender of a piece of land, particularly necessary to make the road a safe width, was made by Mr. Edwards. This cost the Association £80. In 1893 District Councils commence, and there is some talk of the Association’s work being finished, but far from it. In 1895 the committee were instructed to consider the possibility of publishing a map of footpaths within a radius of eight miles of Leicester. This resulted in the issue of our footpath map in 1904 (link to map page), which has been instrumental of keeping open many paths which otherwise would have been lost. The work in carrying out this was immense, and the care taken such that there have since been very few disputes about the maps marked. The public owe a debt of gratitude to Mr. A. J. Gimson, Mr. C. H. Green and Mr. Berry, especially in this connection, and few will realise the enormous amount of labour this map entailed. Of 101 maps sent out to Parish Councils for inspection, only one objection was received, but twenty-five were returned without comment and five not returned. The map got the Society heavily into debt, but it has gradually righted itself with the sales. Just before the war it was proposed to extend the map. The work was commenced, but had to be discontinued until recently, when it was resumed thanks to the work of Mr. Flower. The north side is the first section, which is nearly completed. At the present moment we have run out of the whole edition of the Forest side of the map, and it is hoped that some local Maecenas may help us to republish it with extensions. Just before the war, in order to popularise the sale of the maps, a series of Footpath Rambles were published, which were originally written by Mr. Rippin and others, and published in the local press. Out of this grew our Rambles section in 1922, which is a very vigorous and valuable side of our work. They are kept up all through the year and joint rambles are arranged with other societies. In 1896 the late Archdeacon Stocks became chairman and that year the Society entered a vigorous protest to the Town Council against selling the Recreation Ground near the jail. In 1897 Mr. T. Grosvenor Lee gave the iron gates for the pretty old path to Braunstone, alas! now no more owing to the development of building. In 1898 came the Hathern case and fight for paths near the Zouch mills, which the Society supported and won. During the next year the Anstey Lane again was threatened by a light railway proposition. About this time, 1900, came the interesting case about the path at Stoke Golding, which goes from the Crown Hill, the spot where Henry of Richmond received the crown after the battle of Bosworth Field, to the White Moor, where Richmond’s army was encamped the night before the battle, a path of historic interest as well as of value to the residents. In 1901-2 we joined the National Trust in a local survey of properties that needed scheduling, and next year, 1903, Canon Sanders became chairman, and a very genial one he was for many years. In 1905 the first serious diversion of the paths at Croft commenced. The owners of the quarry applied to the Quarter Sessions on the grounds that the path was unnecessary, and that the present working of the quarries necessitated a small part of the path being cut away. The Association felt very strongly that it ought to be an established principle that, where a right affecting the general public is interfered with, for the sake of a private company or public body, or even for the convenience of the residents in a particular locality, the general public should receive some equivalent for their loss. In this case it was suggested as quite possible to make an alternative route or the road which would have to be used might have been made safer and wider, as an equivalent. However, local evidence was not forthcoming, as almost everyone is employed at the quarries, so we had to withdraw our opposition and pay the expenses. I should not have mentioned this case except that a similar Question about the paths on this hill came up later with the same result. In nearly every other case where other diversions have been made by companies or landowners for the benefit of their work, alternative convenient paths have been provided. In 1921 we appealed against the use of Freemen’s Meadow for an electric power station, as it would, with the Freemen’s Common, University grounds and Victoria Park, have kept a band of open space in the rapidly growing town. It is hoped that the Town Council will watch this question if the Agricultural Society’s ground ever comes up for sale, and keep the open space, which will be invaluable in the future. Year by year comes up a crop of small complaints which are investigated by the committee. The extension of the town has spoilt many of the pleasant old paths nearby, and the Highways Committee do not look after the public rights well enough when passing plans for these diversions, or they would get compensation for the advantages the diversions mean to the landowners. The little Society does its best to keep watch on these more and more valuable rights and gets too little support from the public, either financial or otherwise. Perhaps our fathers were more aggressive than we are. Certainly their reports suggest it, but we try to keep the flag flying, and at any rate those who feel this Conference is a success should remember that it was our Society that first offered to bring it to Leicester and its members have done their best to make it so.